It’s Friday night, out driving around town with the windows down and what better album to have playing than Bruce Springsteen’s The Wild the Innocent and the E Street Shuffle. Maybe a live track or a studio cut. Or even if you’re having a bad day Nebraska will make you feel better in no time. I know how corny all of that just sounded but what the hell why don’t you give it a try. Listening to a performer like Springsteen who is 65 years old may not appeal to most but if you listen to a record from 40 years ago he was only 25… Bad jokes aside music is music no matter who made it or when it was produced. These days there are bands popping up left and right and with the internet they have unlimited marketing opportunities. Being 65 years old and still being able to make music and have a following is huge. This is just one reason why you should listen to Bruce Springsteen, just look at all the fans he has old, and new. Beginning his career in 1973 with his debut album Greetings From Asbury Park Springsteen was starting to be recognized as the new Bob Dylan. Jon Landau after hearing Springsteen for the first time said “"I saw rock and roll future and its name is Bruce Springsteen.” Being the son of a Bruce fanatic I learned to love Springsteen myself and acquire my own thoughts and likes through his music. Now that I am an adult I could compare myself to being just as big if not a bigger Springsteen fan than my father. I owe some of my happiest times to times listening to Springsteen or being at one of his concerts. But really getting down to it I don’t think it was just the fact that I grew up listening to this music that I fell in love with it. Bruce Springsteen’s songs stand the test of time and are relatable in almost every circumstance. Springsteen seems to have a song for whatever mood you are in, whether you need to turn a smile on your face or comfort you in a time of need. With 18 studio albums and countless album outtakes there is a song for anything. The most beautiful things about Springsteen’s music are that it correlates with the times, spans genres, and sends positive messages. With every album Springsteen only gets better. With progression in the band and writing styles and overall album styles it’s not a hard job to find one you like the best. Personally my favorite album would have to be his second The Wild the Innocent and the E Street Shuffle which touches upon rock n roll, jazz, r&b, and folk. Yes Springsteen is technically a rock n roll artist but his music spans so many more genres taking from all types of music to create something truly beautiful. For a first time listener I suggest these tracks to influence your future love of Bruce Springsteen. And if you’re looking for something a little heavier – Murder Inc. I know most of you have already heard something of 1975’s Born to Run or 78’s Darkness on the Edge of Town but I promise you there is more, and although those albums are great, there are better songs out there. It is a little overwhelming the amount of material to leaf through but all the work is well worth it. 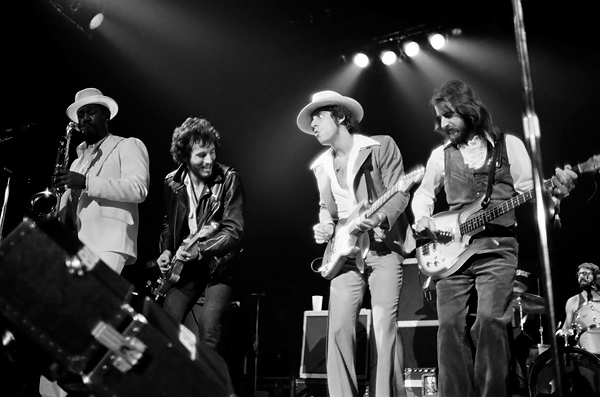 Before I lose any of you I’d like to mention the always electrifying and power driven 3 and half hour concerts that Springsteen and the E Street Band put on. If you ever have a chance to see Bruce live you better do it or you might regret it in the future. Attending thirteen shows myself I’ve heard my favorite songs multiple times and have always sang my heart out. If you haven’t been to a show where every single person is into every second then you’ve probably never been to a Bruce Show. There is never a dull moment and you’ll find yourself smiling, singing and having one of the best times of your life. Even if you don’t enjoy Bruce that much or don’t know his songs enough to sing along it will be one of the best concerts you will ever attend. That is just how great of a performer this man really is. I don’t think I’ve heard of anyone else performing for three and a half hours with no breaks. And the band behind him I shouldn’t even have to mention. The E Street Band is one of the best bands in the world playing songs they didn’t even write from a sign request in the crowd. On one tour they even played a little game they liked to call stump the band and played over 50 covers of famous songs. I remember hearing once that the only thing the band needed was the way Springsteen counted off to know which song to play. Whether you enjoy rock n roll, or country, or jazz or really any other genre there is a part of Bruce Springsteen’s music you will enjoy. So I recommend even for one night given Springsteen a listen and see just what his millions of fans love about his music. I highly believe you will not regret giving this artist a try. Even if I am just ranting about my love for Bruce Springsteen I think that does enough justice to give listen or two.